We all want to keep our guns secure while having them available in case of emergency. But often, those safes are secured in one location. What if you’re looking for a gun safe to store a single handgun in your home or vehicle, or perhaps that could be moved between the two locations? Then the MV500-STD Microvault may be what you’re looking for. The padded interior measures approximately 10.75” x 6.5” x 2” so most conventional handguns should fit in this safe along with a magazine. This top-opening safe could easily be stored or secured in a drawer within your house, but it’s features make it more suitable for transferring between your house and car. The design is slim, and it would easily fit under most car seats. Plus, it comes with a steel security cable, tested to 1500lbs of strain, to secure it to a stable fixture such as a seat within a vehicle. The 16-gauge steel from which the safe is made, along with the pry-proof lid, is strong enough to withstand most attempts to break in with hand-tools, but remains light enough to carry. Some criticisms are that the safe feels a little flimsy, but I disagree. Use any thicker steel and the weight, currently about 5lbs, goes up, making the safe more uncomfortable to carry in a backpack or briefcase. This seems like a good compromise. The high-strength lock is controlled by an electronic 4-button keypad that, if you follow the instructions, is easily programmed with one of the 12 million (as claimed by the manufacturer) possible codes. A 9-volt battery is required for the electronics and, as is usual nowadays, this is not supplied. This also powers the lights and the sound that lets you know you have pressed the button correctly. One entry is the pressing of one or more buttons, and you use at least 3 but not more than 6 entries for your code. Think of it . . . 12 million. No-one is getting access by guessing or by luck! And for added security, if someone fails to enter the correct code within 24 entries the system not only goes into lockdown for 2 minutes it also uses a flashing light to let you know that this has happened. 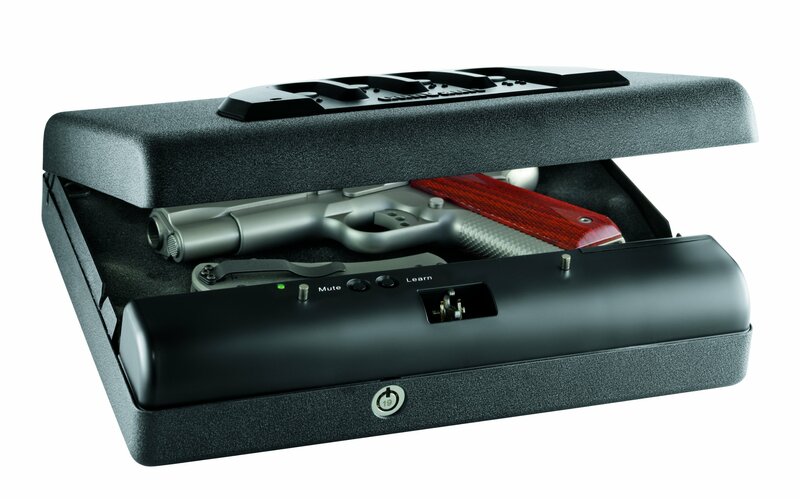 As on most of the gun safes made by this manufacturer, the area around the buttons is molded in their patented fashion, to allow you to enter the code one-handed in the dark or with your eyes closed. With a little practice, quick access becomes second nature. The manufacturer, however, has recognized that some people do prefer more of a stealth mode, so they have included a button to disable the alarms. 2 override keys are provided in case the keypad fails. Although the safe can be affixed inside a drawer, I would tend to avoid this. The lock for the override key is on the front of the safe, and as poor battery life (or the low-battery warning light not functioning until the battery is completely out of power) is relatively common among negative reviews, if it were fixed in a drawer it would be difficult to reach if needed. Also, because the weight and construction aim for portability, why would you want to ignore one of the obvious benefits. Many of the negative reviews feature comments about the keypad failing, usually—but not always—after extensive use. Anything that may prevent quick entry in an emergency situation obviously has to be considered when buying this type of product, but the number of reviews mentioning keypad failure is small compared to the total number of reviews. Other complaints talk about the “feel” of the buttons being mushy, but this is actually addressed in the manual where the purchaser is advised to practice entering the code until familiar with how the buttons respond. The reports of keypad failure are somewhat concerning but do seem infrequent compared to the overall number of sales and reviews. Taking this into account, at just over $100, this is an affordable little safe designed more for portability than for home storage. If you are looking for something to affix in your home, there are possibly better alternatives out there. If, however, you need something that you can keep in your car, or perhaps carry with you, this is a good choice.